Having completed its journey, 156 is seen here turning round at Whitley Bay Bandstand before returning to North Shields Ferry Landing. 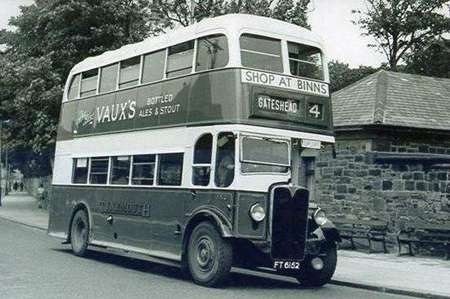 The service 8 was known to crews as ‘the track’ because it followed the exact route of the Tynemouth and District trams. The AEC Regent II chassis was well built, rugged and reliable, and was available in two options, take it or leave it. The engine was a 7.7 litre diesel, and the transmission was a 4-speed sliding mesh gearbox with friction clutch. It was an entirely different matter when it came to choice of body. NGT Percy Main depot opted for the H30/26R Weymann. This is one of twenty nine of the type delivered to them between 1947 & 48; the 1947 intake were FT 5698 to 5712, 128/142, and 1948 were FT 6143 to 6156; 143/156; they were all ‘Tynemouth’ apart from 141 – 142 & 156 which carried the Wakefields name. The first vehicles to carry this style of livery layout were the 1958 Orion bodied PD3/4’s, so the photo is after that date, but just look at the collection of coaches in the background. Good to see a Regent II. I used to take them for granted in Reading, where they were the mainstay of the motorbus fleet from 1947 to 64, but they seem rare today. Was the choice of 5 bays a matter of date, of chassis design or of operator’s choice? According to "Weymann Part 2", these were delivered (due to shortages) without destination blinds and with metal panelling covering the "empty holes". I think that the matter of 4- or 5-bay bodywork is a matter of date. The 5-bay was standard in the immediate post-war years, on AEC and other makes. I am fairly sure I read somewhere that Weymann re-designed the body as four-bay for the AEC Regent III chassis, but did not build it on other makes/types, at least initially. Perhaps those with access to the "Weymann Part 2" book will find some detail, as my memory may be in "error mode" on this one. Michael, I don’t know when the change came about, but Percy Main’s 1952 Guy Arab III’s ‘FT 7381/90 – 181/90 were four bay type. 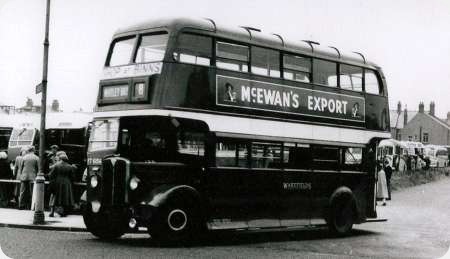 They were also P/M’s first 8ft wide D/D’s, and the first with sliding cab doors. I think, originally, that AEC and the body-builders colluded to make a four bay body – but it relied on body fixing points. Guy and then Leyland eventually caught up by building chassis with compatible points and then Daimler. [Bristol was obviously a different case.] What was more interesting was the reversion to five short bays with the appalling early Orions. What was the difference between a Regent II & III’s. We had Regent III’s in Sheffield around the same year. They had pre selector gearboxes though. AEC Regent. Mark I, II and III. AEC Regent 661 petrol engine was built from 1929-1942, powered by an AEC A145 7.4 litre engine, many of the early examples had the open staircase later enclosed and the typical 30 seats over 26 seat layout became the standard design on a 27 foot long by 7 feet 6 inch wide chassis with over 7000 built. AEC Regent Mk II 661/O661 was developed in the late 1930’s at 27 feet 6 inches by 7 feet 6 inches with the A173, 7.7 litre 6 cylinder diesel oil engine, resulting in the London Transport RT 1-151, the Regent II was curtailed during the second world war but recommenced after the war with only 700 built. After the war AEC with London Passenger Transport Board had developed the AEC Regent III O961 with the more powerful AEC 9.6 litre engine. 8261 were built over the next 10 years, most of these were the iconic RT for London Transport. The Regent II had a 7.7 litre engine, sliding mesh gearbox and vacuum brakes. The Regent III was its successor, and could be supplied with the same spec, in which case there was very little difference between the two. Most Regent IIIs however had the 9.6 litre engine, and many of these had air brakes and air-operated preselector gearboxes (especially in Yorkshire!). In this form the Regent III was a development of the London RT type which had its origins just before the war. I have only just noticed that four years ago Ron Mesure attempted to give a fuller and more detailed answer to Andy Fisher’s question than mine. Unfortunately this is mainly incorrect. Firstly, the petrol engines used in the Regent 661 were of 6.1 litre capacity, the 7.4 litre A145 being reserved for the three-axle Renown. Diesel engines included an 8.8 litre and a 6.6 litre unit as well as a couple of Gardners (rarely fitted). Secondly, the version with the 7.7 litre engine was not called Regent II before the war and did not include RT1-151, which used a 9.6 litre engine like all subsequent RTs. Although designated as O661 and built before the Regent II was introduced, RT1-151 (and an odd similar chassis for Glasgow) are now regarded as the first Regent IIIs. Thirdly, the lengths quoted are incorrect, as the maximum length of a two-axle double decker was 26 feet until 1950. After the Intake of early 1940, no more vehicles arrived at Percy Main until 1946, in the meantime, seven vehicles were transferred to other Northern General Transport depots, eight more were requisitioned by the Ministry of War Transport. A total of 15 from a fleet of around 110 was a sizable chunk. For a while, spares availability became a problem, so it was not uncommon for vehicles awaiting parts to be cannibalised to keep others going. The first post war intake arrived in 1946 in the form of five H30/26R Northern Counties bodied 5GLW Guy Arab III’s. However, as has been mentioned before, Northern General Transport allowed its subsidiaries a degree of independence with vehicle choice and spec, so it was not long before Percy Main reverted to AEC. It’s surprising how many Percy Main depot buses have appeared in model form. AEC Regent 135 (similar to the above photo) was issued by Corgi many years ago. 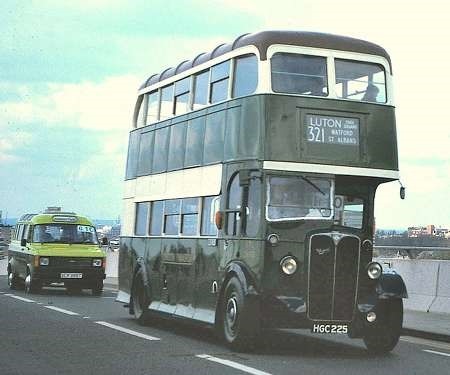 They also issued Leyland Olympian 3593 from a later era. Britbus weighed in with Coastline Atlantean 3458. E.F.E. have been the most prolific with Leyland PD2 / Orion 230, AEC Renown as Tynemouth 333 and yellow Northern 3743, Atlantean / MCW yellow Northern 3194 as well as yellow Northern National 4444 and Coastline Wright Low Floor 4769. Quite an impressive representation really for one depot. A query about this photo is the location. Looking at it, it could be Park Road, Whitley Bay. The area behind the bus was originally occupied by Whitley Park Hall. This later became a hotel, and part of the grounds became the Spanish City. The hotel closed and was demolished in the thirties. In the mid sixties, a new library was built on the site replacing the previous library which was located at the United bus station. All this has now gone. The Spanish city has been replaced by a new school, while the library has been relocated nearer the town centre. Park Road itself has since the late sixties been a one way street in the opposite direction to which the bus is travelling. None of this is relevant to the bus, but part of the fascination of old bus photos is seeing how much has changed – not just the buses, but the surroundings. It could be Park Road, Whitley Bay, very close to the junction with Park Avenue. Linskill Terrace, Tynemouth, is another possibility. However the curve in the road there occurs at the north end of Washington Terrace and you would expect to see behind the bus some of the Edwardian-era houses between Washington Terrace and Park Avenue. When I first saw this photo, I was not too certain of it’s location. The photo as reproduced here has been somewhat cropped, but the bends in the road which can be seen more clearly in the original seem to match those on Park Road. There are also buildings in the distance which look to be those between Marine Avenue and the Spanish City. As Paul Robson says, it looks as if it was taken close to the junction with Park Avenue. I would agree however that it could be elsewhere and Ronnies suggestion of Linskill Terrace is certainly a possibility. Regarding Keith Bruce’s comments about models of Tynemouth vehicles, the E.F.E. model of 230 is a nice model, but it should be a PD3, not a PD2. Having looked at this again, I think we could all be wrong. It could well be Wallsend Road, at the foot of Balkwell Avenue, opposite the Pineapple Pub. The trees would then be in the grounds of St Joseph’s R.C. school. The present church was built in the late 50’s or early 60’s, which would be after this photo was taken, and the area on the bend where the stone wall is now has a low brick wall which is at the edge of the car park.